Arkansas Online 8 February 2016 USA: The head of Little Rock's Animal Services Division wants to fight feral cat overpopulation by returning captured cats to the street. Instead of killing all wild cats, volunteers would trap and sterilize the felines. After vaccinations, the cats would return to a colony within the city, where they would be monitored and fed daily. The idea has some opposition, especially among wildlife conservationists, but Tracy Roark, manager of the Little Rock Animal Village, believes it's the best way to stymie the city's exploding cat population. "We've been doing the same thing for so long, and it's not working," Roark said. He plans to propose his idea soon. 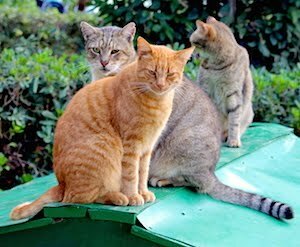 "Cat colonies" have recently gained popularity in areas where people are eager to decrease feral cat numbers without euthanization. Feral cat overpopulation is one of Little Rock's largest animal control problems, officials said. Animal control directors around the state agreed that...read on.